(TibetanReview.net, Aug03, 2016) – China has jailed yet another Tibetan Buddhist monk in Ngaba (Chinese: Aba) County of Sichuan Province after arresting and keeping him disappeared since Sep 2015 when he staged a lone street protest, holding up a picture of Tibet’s exiled spiritual leader, the Dalai Lama, reported the Tibetan Service of Radio Free Asia (Washington) Aug 01. 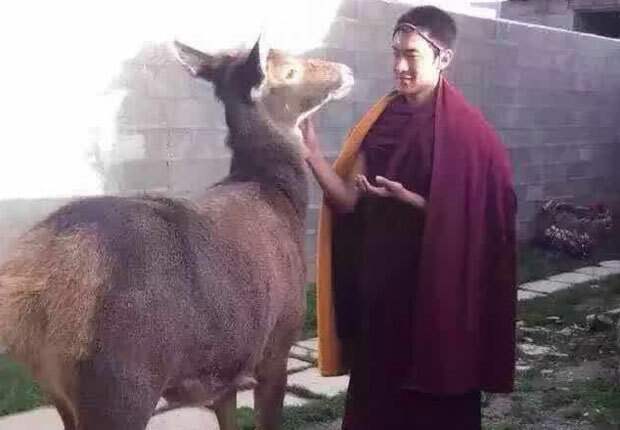 The report said the monk, Jampal Gyatso, 22, was sentenced in a secret trial, with no opportunity being given to his parents or other relatives to attend the hearing or to hire a lawyer to represent him. He is serving a three-year jail sentence, the monk’s family has learned on Aug 1, although it was not clear when the trial or sentencing took place. The monk of Ngaba’s Kirti Monastery was held in Sep 2015 after he staged a lone street protest on the main street of Ngaba County seat, shouting calls for freedom for Tibetan people while carrying a photo of the Dalai Lama. Several Tibetans who witnessed the protest scene were reported to have shouted in support of him before he was set upon and taken away by Chinese police. Jampal Gyatso is said to be held in a prison in Maowun (Mao) County, located about 350 km (217 miles) from the Ngaba county seat. There is no information about his health and other conditions. The report said the monk originally belongs to Ngaba’s Meruma village group No. 3 where his father Surya, mother Tare Kyi, and a brother and sister live.